The end of summer: the end of this year’s sun-ripened tomatoes (in the northern hemisphere that is). I am a big fan of seasonal fruit and veg. Yes, you can get strawberries in November, but how do they taste? 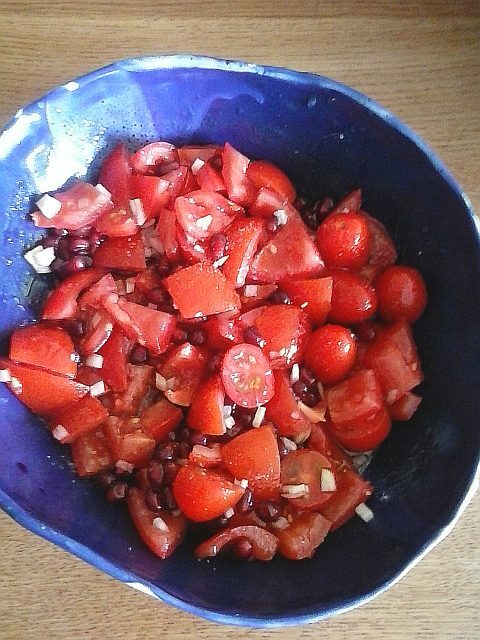 So here is one last tomato recipe for 2015. I remember once being on holiday in central Portugal at the beginning of September. We drove up and down the narrow country roads and would often get stuck behind tractors heaving enormous loads of tomatoes to the canning factories. And very useful canned tomatoes are, too. But for now, enjoy the fresh kind. Pomegranate gives them a bitter-sweet edge. I saw this idea on a programme on the local food channel a while ago: a young Lebanese couple prepared it together, teasing and laughing the whole time. Wish I had caught the name of the programme. When I googled it, I saw the great Ottolenghi also makes it. If you can get pomegranate molasses, drizzle some over the top at the end. Oh yes, I must admit I am no seasonal/local food purist: I think pomegranates naturally ripen in December. And the beans in last week’s curry were flown to Holland from Zimbabwe. Chop the tomato into bite sized pieces, removing most of the seeds. 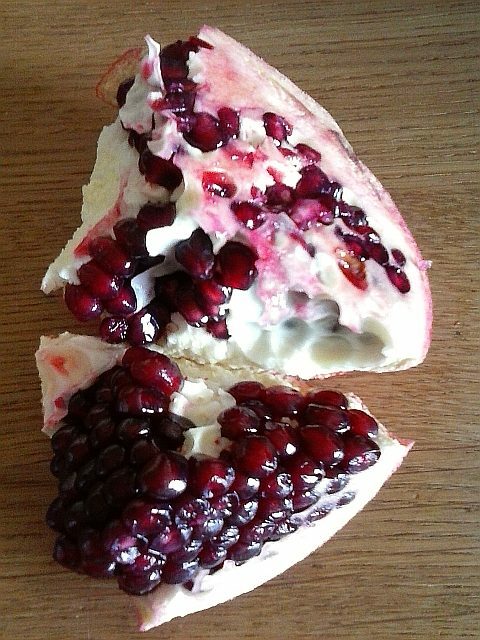 Cut the pomegranate in half and take the seeds out of one half. Some people do this by beating it with a wooden spoon, but you can just pick the seeds out of the thick peel if you prefer. Combine the tomato, pomegranate and chopped onion. Squeeze the other half of the pomegranate on a juicer until you have about 2 tbsps of juice. Make a dressing by combining the pomegranate juice, the olive oil, vinegar and sugar. Season with salt and pepper. Allow to sit at room temperature for at least half an hour to allow the flavours to blend. Great served with couscous or quinoa salad to absorb some of the delicious dressing.